Awarded to everyone who visited Habbo during December 2006. Happy Christmas! Throwback to the 90’s with HabboQuests! Grupo feito para Brasileiros e Portugueses, que tentam uma vida melhor VIRTUALMENTE, e REALMENTE, e por meio desse grupo, ter um pouco do brasil em pixels. Get up and free yourself from bobba up inside you, like the calm beneath castles, is a cavern of treasures that no one has been to. Let's go digging. Bring it out to take you back in. Who never did throw the first stone! 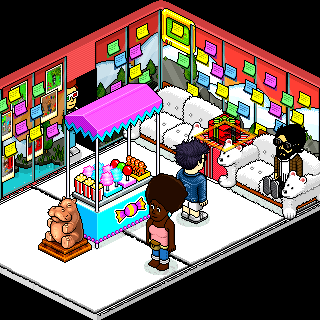 Previously named Habbo Collectors Group, The Dusty Pixel Collection is a rare/collectable/old furniture collection. Established in August 2013. R.I.P. 27th November 2014. RR badge for final contributors and VIPs in Ultra Rare Trade. Group Members inducted into URT Hall of Fame. Stand on the maroon laser portal and you will be teleported to one of the pods.Enter the game and run from the flowers if they catch you, you will lose and teleported back to the quee.To win the game stand on the marble tile at the end. Welcome people, join group if u want or favorite the room to dont let it disappear. credits to .Mascarenhas.. , Created In : November,1 ,2013. --------------------------------------------- Venha tomar café e discutir assuntos filosóficos!!! Quem disse q a vida é só trabalho e dureza? Venha se divertir !!! Você nunca viu um mundo assim !!! Taken in this room on 5 July 2015 and received 0 likes.